Things are pretty normal around here so far this week. 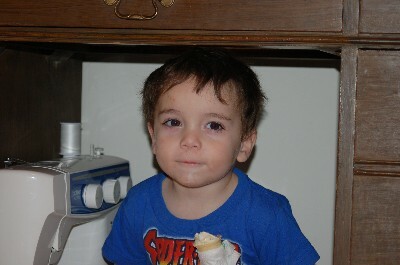 Jonathan and I are hanging out around the house, and Justin is working at the school for the rest of the week. he's doing music again, so I think he's kind of liking that. The photos I'm posting today are a little old. I think they were from the beginning of February. First, you can see Jonathan's boo boo he got when he ran off of the steps at someone's house and fell flat on the sidewalk. You gotta love those little bumpy scrapes from the sidewalk. 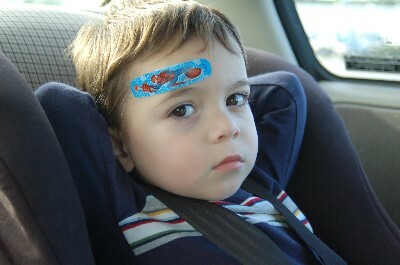 His boo boo is actually better by this photo, but he saw it in the mirror and HAD to have a Spiderman band-aid (courtesy of Nana). The other photos are him eating the ice cream Papa left at our house when he visited. I can't believe he picked vanilla over chocolate. Whose child is he? 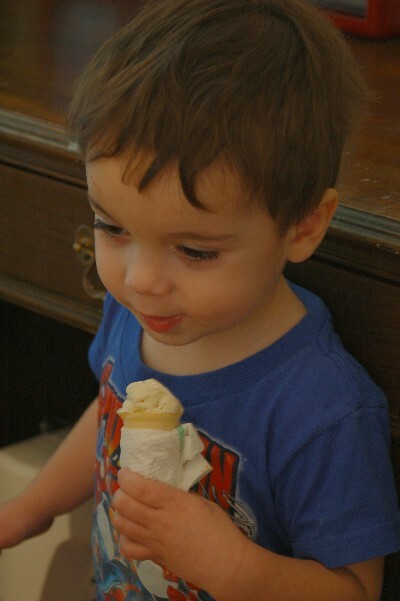 I put it in a little cone for him, and he had fun--until he got down to the end. He dropped it and said, "Eeeew, that's nasty!" Oh, and he is sitting on a Coke crate under my desk. i guess that looked like a good place to eat ice cream.